Save money: How to make your own Ethernet patch cord. This simple, no nonsense guide, will teach you how to make a good Ethernet patch cord at a fraction of the price it would cost you to buy it pre-manufactured. Or, even better, a complete kit with all of these accessories already included. First, start by pulling off the desired cable length from your Box. Don't pull out 400 feet, the maximum length for a cat5 cable is approximately 300 ft. , after this, the performance degrades quickly. When you are satisfied with the length, cut the cable with your crimp tool or a cutter. Remove 1 inch of sheath from both side. Use the wire stripper that's integrated with your crimp tool. Be careful! You must not cut the little wires inside! If you do, cut off your cable on the side where you messed up, and start again. Separate the 4 wires and untwist them. Now arrange the wires following this simple schema. (Edit: Some users are using T-568B for straight cables. A or B, it doesn't really matter, both brings you the same result). A straight cable is made to connect a device to a switch, hub or router. A Crossover cable is for connecting 2 computers directly to one another. When you are satisfied with the result, cut the 8 wires leaving about half an inch of them sticking out of the blue jacket. Be sure that all the ends form a straight line; they have to be even if you want them to fit properly in the RJ-45 connector. Finally, insert the 8 wires in the RJ-45 plug, making sure that the clip is facing down. Push the wires into the connector. The wires must touch the end of each little corridor. If they don't, remove them, rearrange them, and try again. Be careful when you do this, the wires may end up in the wrong position if you are not careful. Inspect your connector to see if the wires are in the correct order, and if they are, stick the RJ-45 jack in the crimp tool, and crimp it as hard as you can. 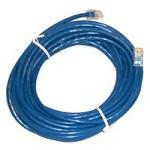 A 10 ft. cat5e patch cord can cost you up to 7$ in a store. If you make your own cable, each of them should cost you around 1,20$. Good deal hey? There are actually two different conventions. The one you pictured was the "A" convention, there is also a "B" convention. It doesnt matter which way you choose, but I would also suggest some sort of network testing tool if you're going to make a lot of ethernet cord. Or you can order from a discount cable place and get a 10ft Patch cable for $1.30 Qty 1 or $0.94 for qty 1000 and up... Froogle / Google for it, I don't want to be accused of being an advertisement... I just ordered a lot of cables just because it was cheaper than a fully loaded expense of having someone make them... and they come with boots so they won't snag... But for when I need custom cables this will come in handy! Gateway Electronics. Try looking around for a jobber. More importantly, the large boxes of cable are generally one wire per conductor and are fine for in place wiring. Patch cables are often a stranded wire for each conductor for greater flexibility and durability. I suggest buying from monoprice.com instead. Prices are *much* cheaper and the quality is great. When you buy your box of cable, you can get "stranded" or "solid core". Stranded cables handle the stress of being bent and handled better than solid core. Make sure that the RJ45 mod plugs you purchase match the type of cable you buy. Some mod-plugs are dual use, and work for both solid and stranded. 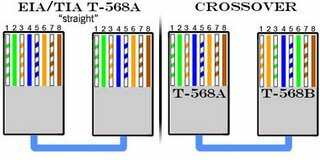 Also, using T-568-B on both ends of a straight through cable is much more common (at least in the USA) and will match better if you are punching down to a patch panel, or other similar things. maybe i'm missing something, but for a straight patch cord, does it really matter what the color scheme is as long as it's the same at both ends of the cable? i don't think the electrons care what color the insulation is, just that there is a copper highway for them to flow through. of course, that's not to say that it wouldn't be best to stick to the standard scheme. A little trick I use to make inserting the wires into the end is to first get the wires arranged for the scheme you are using, then rather than cutting straight across cut at about a 3-5 degree angle. This then lets you insert the wires so that they enter the small openings one at a time. Makes it easier to ensure they are going in the right way. Then just push down quite hard to make them all go all the way in. Visually inspecting from the end of the jack to be sure the conductors are all the way in before crimping and you'll have less redos. "Also, most of you probably don't know this, but there is reason for the order in 568A/568B connectors. The pairs of cables in the cable are twisted together at different ratios (called "twist ratios"). When an electrical current travels down a twisted pair of wires, a magnetic field perpendicular to the twist occurs. For ethernet, only pins 1,2,3,6 are used (the orange and green pairs). One pair is tightly twisted and the other is loosely twisted. This causes their magnetic fields to be out of synch with each other, and minimizes crosstalk. This results in much better transmission, and reduces data loss." Ensure that you use good quality connectors! I produced a bunch of homemade patch cables a couple of years back. The wiring was correct, the crimping tool was fine, the cable was, and I was at my wit's end. The cables were partially working. They would work most of the time, if they were short cables, but not at all for longer lengths. It was an absolute nightmare to diagnose. After an inuitive jolt, I went to RadioShack and bought some new connectors. Worked perfectly after that. Beware! At my company we have found that it is actually cheaper just to buy patch cables because the cable heads are expensive. By the time you add up the cost for stranded cat5 cable, RJ45 modular crimp connectors and boots you can buy them cheaper than you can make them. I only needed 1ft cables and they were $0.72 each with the nice style boots that do not come off. Prefab patch cables are cheap. Making them by hand is laborious as heck, especially if you use bonded pair cable. What is your time worth? I'd appreciate if anyone could tell where you are from? Seems to be comming from some newsletter distributed by email, anyone can give me more info?? Did they mention to use starnded wire, not solid core. Extremely important because solid core will loosen over time from the RJ45 where stranded will not because the teeth of the RJ45 go through the stranded wire. Seen this cause "ghosts" in the network more than once. Solid core is for punch down only. At $1 a cable or so my time is worth more than making my own cables. Too time consuming. To the anon that asked the question about the importance of crimping in the order shown in the diagrams... yes, it does matter. In the early days, as long as the colors matched on each side, all was good. With 100mb and 1000mb, the order sequence is vital for full speed ahead. The wires are braided in the sheath of the cable in such a way that any interference that escapes the individual wires will negate each other and reduce problems such as near end cross talk (NEXT). Crimping cables is a good skill to have, but good cables are cheap to buy pre crimped from the factory. Practice my friend, that's all there is to it :) just put them in the correct order between 2 of your fingers, and bend them on one side and another a couple of times until they stay in place, they, shove them in the connector.. It's not the deal you think it will be. Try making 10, or 20 of them. Calculate how much your time is worth. Calculate the nightmares you will experience when your cables are flaky or bad. NEVER MAKE YOUR OWN CABLES. There is value to making your own patch cables, but it's not to have tons of homemade patch cables laying around. 1. Occasionally, you might need to put an end on an already-run cable. (Cable strung across a drop ceiling or down a wall, and not terminated properly.) In this case, you want to know how to do this already, and not re-run the whole darn thing. 2. The only way to get good at doing this is to practice. On a regular basis, I would prefer to purchase my own cables, as it is costing in time to make my own. However, I've run into enough problems where having a couple ends, a stripper, and a crimper can come in WAY handy. One reason to learn how to add an RG45 plug is that ethernet cable strung through a building (such as my home) may need to terminate in a switch which has RJ45 female connectors. I admit I am having a tough time making the connectors work properly!